Coincident with the work describing a telomere resolution step in vivo in B. burgdorferi, the telomere resolvase from the E. coli phage N15 was discovered (Deneke et al. 2000). It had been noted previously that the BBB03 locus of B. burgdorferi had an area of sequence homology with TelN, the protein later confirmed as the N15 telomere resolvase (Rybchin and Svarchevsky 1999). 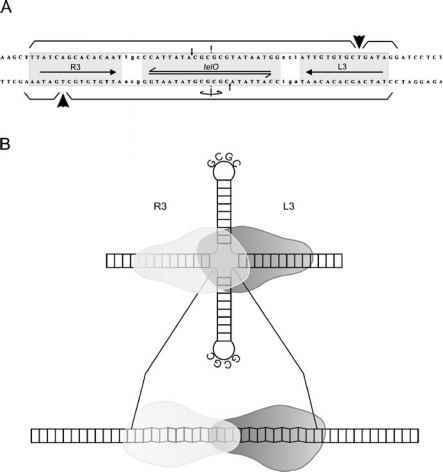 See Hertwig 2007 (this volume) for a review of telomere resolution in phage N15 and other related elements. The Borrelia enzyme that performs telomere resolution was confirmed to be the product of the BBB03 locus of the circular plasmid (cp26) and was named ResT (for Resolvase of Telomeres; Kobryn and Chaconas 2002). The activity of ResT was assayed in vitro on plasmids carrying rTel junctions established to be in vivo substrates. Provided that the negative supercoils of the purified plasmids are removed by prior nicking, relaxation or linearization, ResT resolves these rTels into two covalently closed hp telomeres. The reaction is conservative, site-specific and requires no accessory factors, divalent metal ions or high-energy cofactors.